"Increase revenue and productivity with authentication process"
Authentication for fraud prevention and logon protection is crucial in creating the trust needed to authorize transactions as well as secure accounts. When implementing authentication for fraud prevention and logon protection, organizations are facing the challenge of balancing authentication strength with end-user convenience. Trust Tags can easily equip organizations with advanced authentication capabilities for fraud prevention and logon protection. 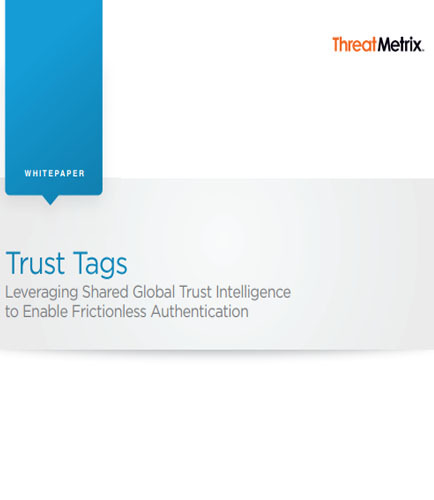 Download this whitepaper, “Trust Tags - Leveraging Shared Global Intelligence to Enable Frictionless Authentication”, to learn how your online business can improve authentication security for customers and employees, quickly and without adding user friction.